Pretty much says it all right there. 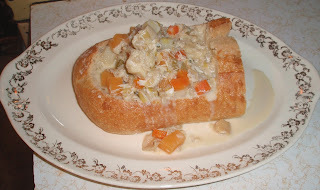 The recipe as written in the blog (entry here) really looked pretty fantastic (OT: it was actually a guest post from another blog about Diana Gabaldon's "Outlander"series - another one of my faves !). I made some minor changes, as I come from a long line of chowder makers and have some definite firm opinions about what goes in a good chowder . The changes include swapping in some potatoes for part of the turnips as I'm not the hugest turnip fan out there (though we had to keep some for authenticity), added some nutmeg and cloves as they were referenced in the book (again with the authenticity...plus they compliment the heavy cream so well), and some other minor changes. 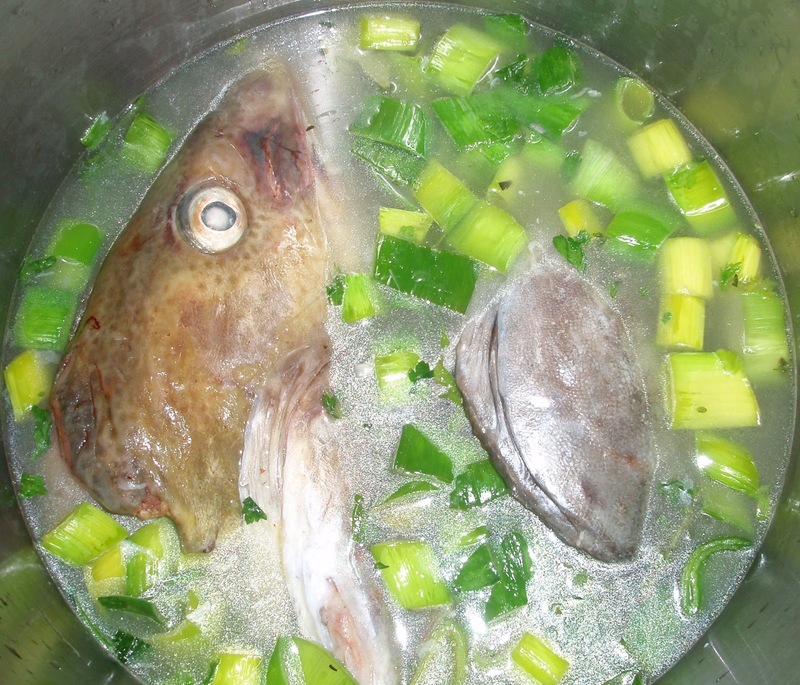 The biggest changes I made, though, were to start the vegetables in salt pork instead of olive oil (no self-respecting Down Easter would use anything but) and to swap our own excellent homemade fish stock for the water and clam juice. Our stock recipe is at the end of this post...now, granted, if you're not a crazy fisher-person like the people who live here you may not have giant fish heads in your freezer...that's just how we roll :) You can sometimes find heads for stock making at your local grocery store or fish market, but if you don't see them, ask - they'll be able to recommend something. Melt the butter in a large saucepan. Add the celery, leeks, shallots, carrots, bay leaves, thyme, parsley and peppercorns to the saucepan and cook over moderate heat, stirring occasionally, until the vegetables are softened, about 8 - 10 minutes. Stir in the fish heads and the wine. Cover and cook, stirring occasionally, about 10 minutes. Add the hot water, stir gently and bring to a simmer over high heat. 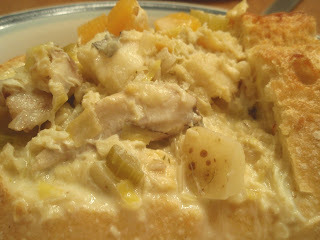 Reduce the heat to low and simmer gently for 30 minutes, stirring occasionally. Remove from the heat, stir once and let stand for 10 minutes. Strain the stock through a fine sieve. 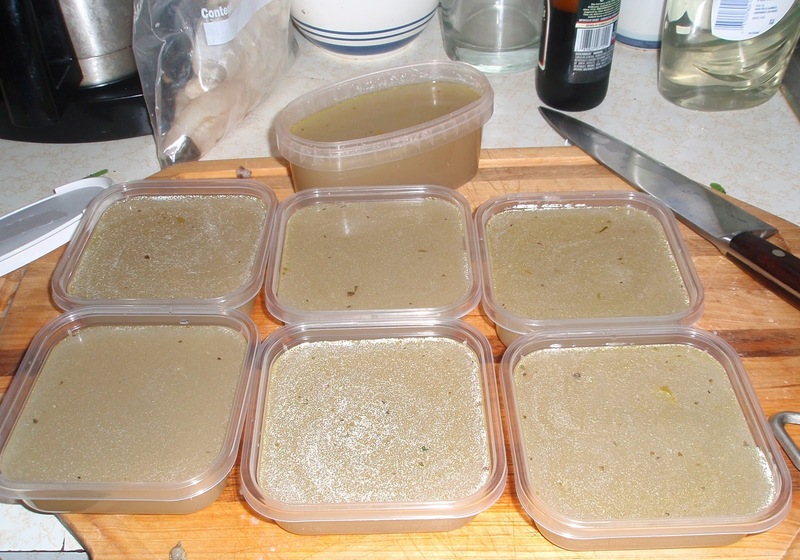 Season lightly with salt and let cool, then refrigerate or freeze until needed. 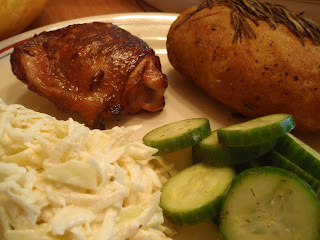 Today’s grill fest starts with a recipe I found ages ago for Shaker-style smoked chicken thighs (which I rediscovered when I was cleaning out my recipe box last week - that’s a process in itself. In addition to my zillion cookbooks, I have a box full of loose recipes dating back to when I was a kid. Every so often it threatens to take over the kitchen, and I have to reign it back in). I’m not sure what makes this “Shaker-style”, but when I saw it involved chicken thighs I knew I had to try it out. I love cooking with chicken thighs – they’re so much more flavorful and juicy than boneless skinless breast (that stuff is practically tofu…tastes like nothing until to you do something to it.) The meat is dark, but not dark enough not to scare off the dark meat haters. I use the thighs in all sorts of things, including my chicken and dumplings, and I haven’t had anyone turn them down yet. 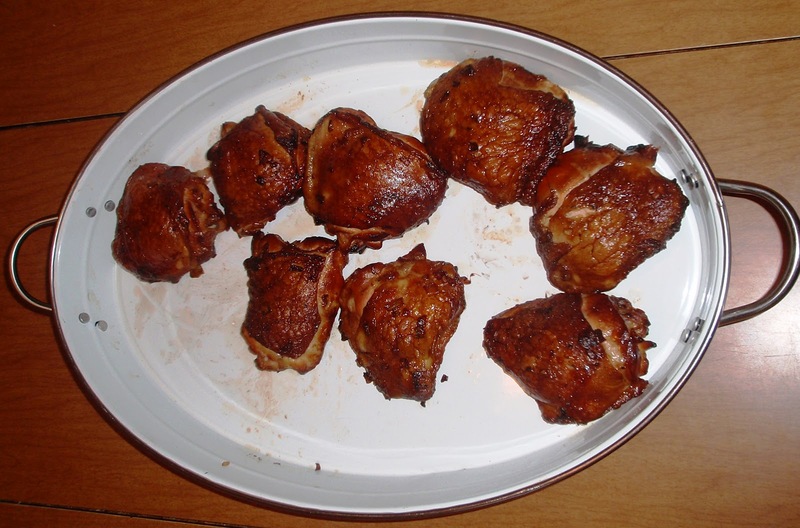 The original recipe from EatingWell.com called for boneless skinless thighs, so if you are really averse to using the thighs I do think the breast would work. I adapted this to use the bone-in, skin-on thighs as I like the juiciness you get from using the whole part. It does take longer to cook this way, but I think the results are well worth it. 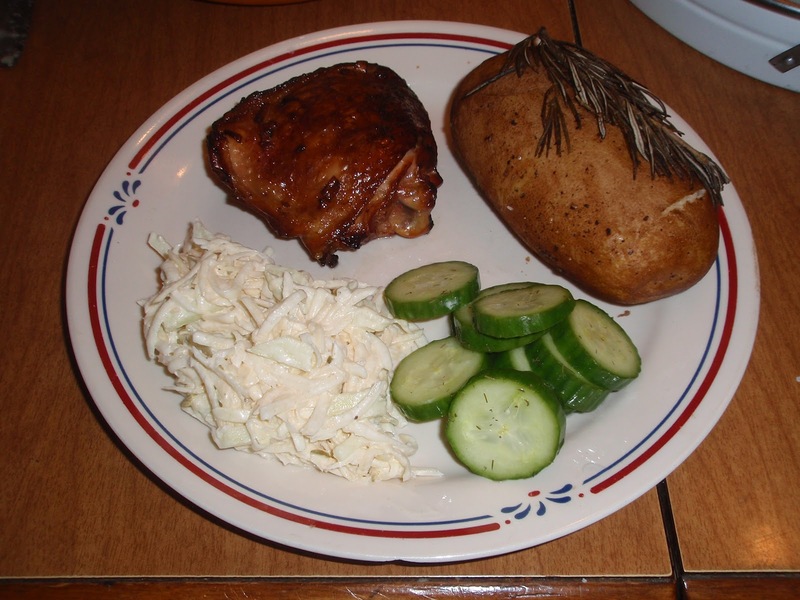 As for the side dishes, the potatoes are something I make for the grill all the time, and they couldn’t be simpler. Wash baking potatoes well, stab them all over with a fork, and lay them on some foil. Brush them with good olive oil, and sprinkle with a few grinds of pepper and a few shakes of salt. Tuck a fresh rosemary sprig in with them, and wrap them up tight. They take about an hour at typical oven temperatures, but if you are smoking instead of grilling then they’ll take a few hours. You can tell they’re done if they give when you squeeze them. ready for my closeup ! 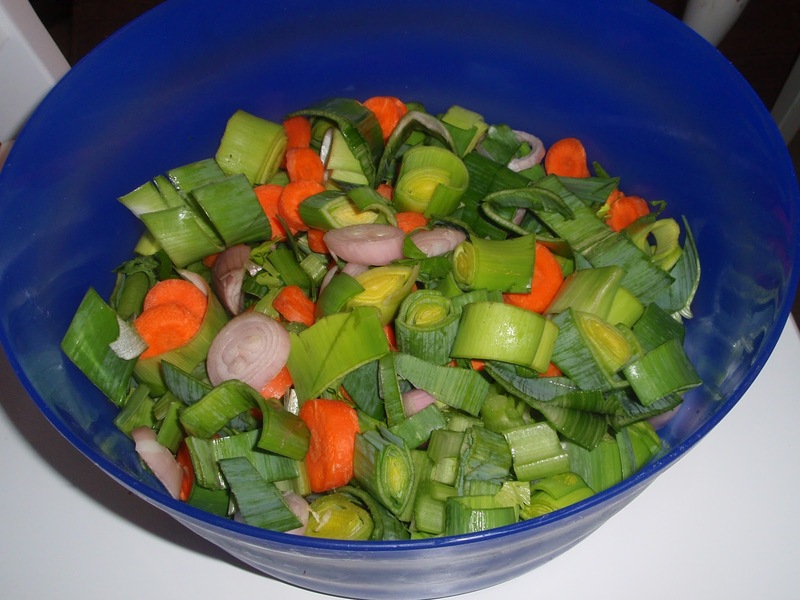 Oma’s cucumber salad is a traditional German dish that I grew up eating, though nowadays I think I have access to better cucumbers than Oma did! It’s basically a quick, fresh pickle – sliced cucumbers marinated in vinegar with a little salt, white pepper and sugar added. This basic marinade is also great with other vegetables – leftover green beans are awesome in it. 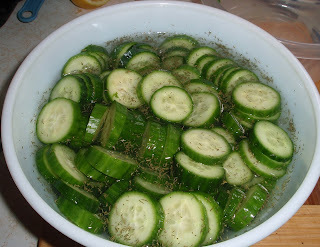 My favorite cucumbers to use are the baby ones that I get at Russo’s, though a good English cucumber will work as well. 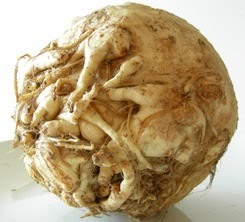 That brings us to celeriac, or celery root - one of the weidest looking vegetables you will ever see. I wrote about celery root in my Oktoberfest post, but it's just so fun I have to write about it again. seriously, look at that thing !! The roots themselves are pretty scary looking, sort of alien potatoes with tentacles – but under that woeful exterior is one of my favorite food items ever, with a fresh, light celery flavor that compliments pretty much anything.The remoulade is something I’ve been dying to make ever since our friend Jonathan made it for our last Facebook Foodie Freakout. 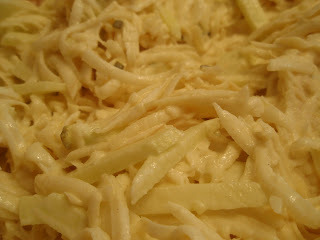 I grew up eating celery root – but in the German style, Selleriesalat (see the Oktoberfest post for the details.) Great stuff, but when Jonathan showed up with the remoualde I was intrigued. 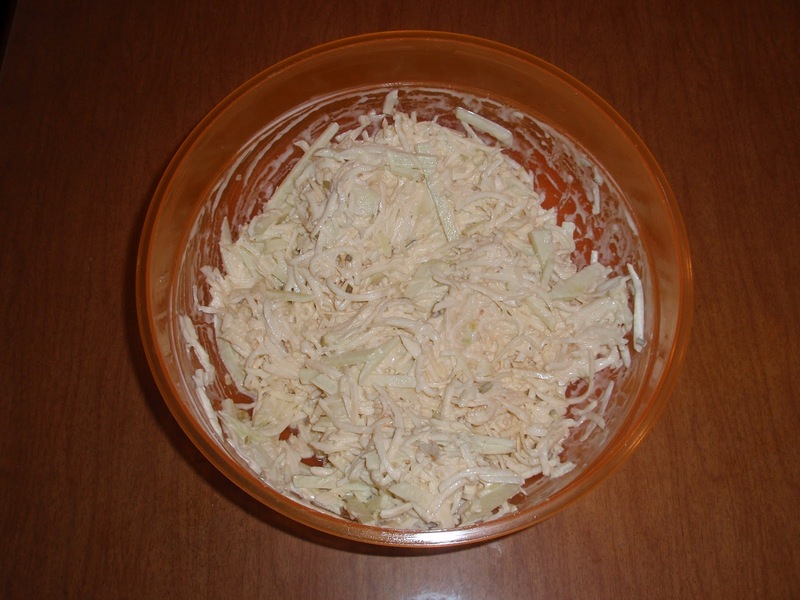 I knew that celeriac remoulade was a classic French dish, but I didn’t quite realize that it used raw, grated celery root. One bite, though, and I was hooked. A lemony, mustardy mayonnaise with that great celery root flavor and a wonderful crunch – sort of like the best version of coleslaw you could ever want to eat. Whisk marinade ingredients together (everything but the chicken), and pour over chicken in a large Ziplock bag or large bowl. Toss or shake to coat, and refrigerate for at least 30 minutes (a couple of hours is even better). Smoke according to your smoker’s directions, or use a foil packet of soaked wood chips on your grill. Cooking time for bone-in is 1 – 3 hours, depending on how much heat you use. Grilling boneless chicken will only take about 6 – 8 minutes per side. Wash potatoes well and prick with fork. Wrap in foil with remaining ingredients. Bake on the grill at 400F for an hour, or longer if you use a lower temperature. By all means, if you want to use homemade mayonnaise in this, go for it! Hellman’s, though, is mighty tasty and a lot less work. Wash, peel and trim the celery root. Grate using the largest holes in your food processor or box grater. 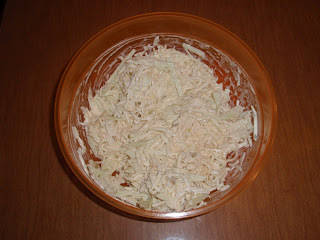 Toss the grated celery root with the salt and 2 tablespoons of the lemon juice. Set this aside for about 30 minutes at room temperature. Meanwhile, whisk together the remaining ingredients (except the apple) until well blended. Stir in the apple and the celery root. Taste and adjust for seasonings (salt? More mayo? More lemon? You be the judge!). Let sit in refrigerator a few hours to blend the flavors, then serve. There are two versions of this salad in Germany – a sour cream version, and a vinegar one. This is my version of the one my Oma made for us growing up. We prefer the peel left on, but taste a bit to make sure the peels aren’t waxy or bitter – peel if needed. 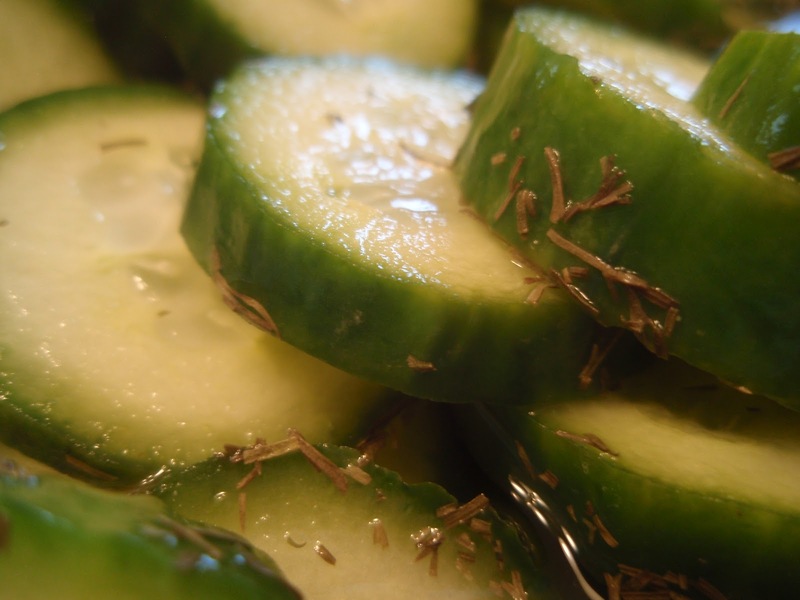 Slice cucumbers somewhat thinly (pickle sized slices are what you’re after). Whisk together remaining ingredients, and pour over cucumbers. Let sit in refrigerator at least an hour before serving.